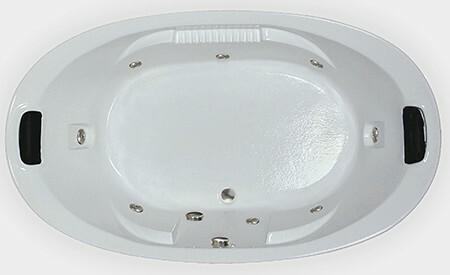 8446 offers a distinctive oval design with inward sloping tub deck. A pillow is located on each end of this jetted bathtub and fits into a sculpted recessed area. This beautiful jacuzzi style bathtub has arm rests for each person. Pillows are attached with suction cups and are easy to remove and reattach for cleaning both the pillows and the bathtub. For those wanting even a deeper water depth, the bathtub can be ordered with an optional Deep Soak Overflow Drain. There are three massage systems to choose from: Whirlpool, Air or Combination Whirlpool & Air so you can choose the best massage for you. Tub Size: 83 5/8" x 45 3/4" x 22"
Bathing Area: 53" x 29"